Oro Province Governor, Hon. 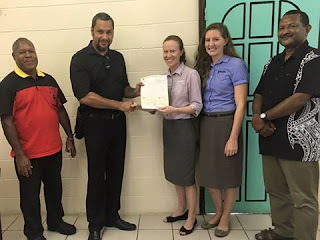 Gary Juffa presented a cheque for K150,000 to YWAM Medical Ships last week on behalf of the Oro Provincial Government fulfilling the first part of a pledge toward annual operational expenses for YWAM’s Training and Medical Ship, the MV YWAM PNG. Governor Juffa said that the provincial administration was a proud supporter of YWAM’s work in Oro Province. “We’ve established a wonderful relationship with YWAM Medical Ships over the last four years – first with their land-based teams and now with their medical ship, MV YWAM PNG. “YWAM’s unique ability to deliver healthcare and training in remote areas make them an ideal partner as we work toward a shared vision – excellent rural service delivery. “We are looking forward to the MV YWAM PNG’s return to Oro early next year – our health workers always love working alongside YWAM’s team of passionate, dedicated volunteers. Together the teams have been able to achieve excellent outcomes for our people,” said Governor Juffa. YWAM Medical Ships Managing Director, Mr Ken Mulligan, said he was grateful for the Oro Provincial Administration’s support. “We greatly value our relationships in Oro Province, and appreciate Governor Juffa’s leadership in establishing this important partnership. “The MV YWAM PNG is currently undergoing Stage 3 of her renovations before she returns to PNG next month. “This upcoming deployment is positioned to be our biggest yet – our capacity for service delivery will increase again once this next round of renovations are complete,” said Mr. Mulligan. The MV YWAM PNG’s Stage 3 of renovations include the construction of a training room, enhance patient waiting area and medical storage space enhanced patient waiting area and medical storage space and the addition of a new extended-range patrol boat, itself with capacity to carry a healthcare team of up to 20 people. The MV YWAM PNG will arrive in Port Moresby next month before starting her first outreach to remote villages in Gulf Province. Other major supporters of MV YWAM PNG’s operations include PNG National Government, Puma Energy, Australian Aid, Steamships Trading Company, PNG Ports Corporation and Morobe, Milne Bay, Central and Western Provincial Governments, along with the Sohe District Development Authority.